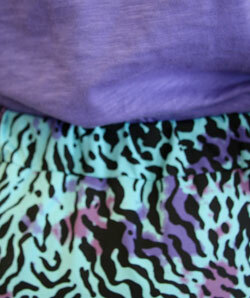 Notes: This skirt is Sydney's first sewing project. 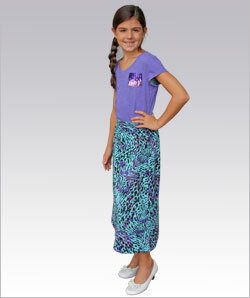 Not only did she get to choose the pattern and fabric, she also got to dictate how long she wanted her skirt to be. And she learned a lot. She discovered what a selvage is, how to measure the grain line, and how to cut smoothy. She learned how to thread a sewing machine, how to guide the fabric to sew a straight line, and how much fun serging is. 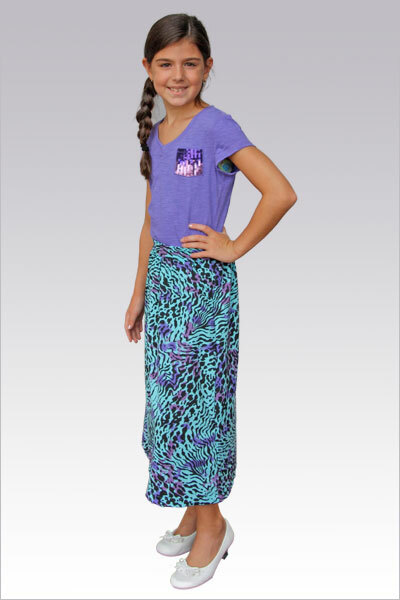 This A-line skirt has angled pockets (notice the perfect 1/4" top-stitching), the front is gathered into a waist band, and the back has an elasticized casing. Recently, she wore it to her first day of school as a 4th grader: her debut as a fashionista.